Colombo, Fabrizio, Sabadini, Irene, Struppa, Daniele C.
Entire functions in one complex variable are extremely relevant in several areas ranging from the study of convolution equations to special functions. An analog of entire functions in the quaternionic setting can be defined in the slice regular setting, a framework which includes polynomials and power series of the quaternionic variable. In the first chapters of this work we introduce and discuss the algebra and the analysis of slice regular functions. In addition to offering a self-contained introduction to the theory of slice-regular functions, these chapters also contain a few new results (for example we complete the discussion on lower bounds for slice regular functions initiated with the Ehrenpreis-Malgrange, by adding a brand new Cartan-type theorem). This book presents the foundations of the theory of holomorphicity on the ring of bicomplex numbers. Accordingly, the main focus is on expressing the similarities with, and differences from, the classical theory of one complex variable. The result is an elementary yet comprehensive introduction to the algebra, geometry and analysis of bicomplex numbers. This book provides the foundations for a rigorous theory of functional analysis with bicomplex scalars. It begins with a detailed study of bicomplex and hyperbolic numbers and then defines the notion of bicomplex modules. After introducing a number of norms and inner products on such modules (some of which appear in this volume for the first time), the authors develop the theory of linear functionals and linear operators on bicomplex modules. 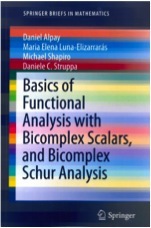 All of this may serve for many different developments, just like the usual functional analysis with complex scalars and in this book it serves as the foundational material for the construction and study of a bicomplex version of the well known Schur analysis. The theory of slice regular functions over quaternions is the central subject of the present volume. This recent theory has expanded rapidly, producing a variety of new results that have caught the attention of the international research community. At the same time, the theory has already developed sturdy foundations. The richness of the theory of the holomorphic functions of one complex variable and its wide variety of applications are a strong motivation for the study of its analogs in higher dimensions. In this respect, the four-dimensional case is particularly interesting due to its relevance in physics and its algebraic properties, as the quaternion forms the only associative real division algebra with a finite dimension n&gt;2. Among other interesting function theories introduced in the quaternionic setting, that of (slice) regular functions shows particularly appealing features. For instance, this class of functions naturally includes polynomials and power series. The zero set of a slice regular function has an interesting structure, strictly linked to a multiplicative operation, and it allows the study of singularities. Integral representation formulas enrich the theory and they are a fundamental tool for one of the applications, the construction of a noncommutative functional calculus. This volume is intended to collect important research results to the lectures and discussions which took Place in Rome, at the INdAM Workshop on Different Notions of Regularity for Functions of Quaternionic Variables in September 2010. This volume will collect recent and new results, which are connected to the topic covered during the workshop. The work aims at bringing together international leading specialists in the field of Quaternionic and Clifford Analysis, as well as young researchers interested in the subject, with the idea of presenting and discussing recent results, analyzing new trends and techniques in the area and, in general, of promoting scientific collaboration. Particular attention is paid to the presentation of different notions of regularity for functions of hypercomplex variables, and to the study of the main features of the theories that they originate. Leon Ehrenpreis has been one of the leading mathematicians in the twentieth century. His contributions to the theory of partial differential equations were part of the golden era of PDEs, and led him to what is maybe his most important contribution, the Fundamental Principle, which he announced in 1960, and fully demonstrated in 1970. His most recent work, on the other hand, focused on a novel and far reaching understanding of the Radon transform, and offered new insights in integral geometry. Leon Ehrenpreis died in 2010, and this volume collects writings in his honor by a cadre of distinguished mathematicians, many of which (Farkas, Kawai, Kuchment, Quinto) were his collaborators. This book presents a functional calculus for m-tuples of not necessarily commuting linear operators. In particular, a functional calculus for quaternionic linear operators is developed. These calculi are based on a new theory of hyperholomorphicity for functions with values in a Clifford algebra: the so-called slice monogenic functions which are carefully described in the book. In the case of functions with values in the algebra of quaternions these functions are named slice regular functions. Sabadini, Irene, Struppa, Daniele C., Walnut, David F.
Progress in Mathematics, Birkhauser, 2006. Carlos A. Berenstein has had a profound influence on scholars and practitioners alike amid a distinguished mathematical career spanning nearly four decades. His uncommon capability of adroitly moving between these parallel worlds is demonstrated by the breadth of his research interests, from his early theoretical work on interpolation in spaces of entire functions with growth conditions and residue theory to his later work on deconvolution and its applications to issues ranging from optics to the study of blood flow. This volume, which celebrates his sixtieth birthday, reflects the state-of-the-art in these areas. The subject of Clifford algebras has become an increasingly rich area of research with a significant number of important applications not only to mathematical physics but to numerical analysis, harmonic analysis, and computer science. The main treatment is devoted to the analysis of systems of linear partial differential equations with constant coefficients, focusing attention on null solutions of Dirac systems. In addition to their usual significance in physics, such solutions are important mathematically as an extension of the function theory of several complex variables. The term "computational" in the title emphasizes the heuristic use of computers to discover results in some particular cases, and the application of Gröbner bases as a primary theoretical tool. Memoirs of the American Mathematical Society, 1983. Given a homogenous system of convolution equations on spaces which admit analytically uniform structures, we want to find conditions which enable us to give Fourier representation theorems for its solutions. In particular, by using methods from the theory of several complex variables, we are able to prove an analog of Ehrenpreis’ Fundamental Principle for what we call slowly decreasing systems of convolution equations. Provides a thorough introduction to the algebraic theory of systems of differential equations, as developed by the Japanese school of M. Sato and his colleagues. Features a complete review of hyperfunction-microfunction theory and the theory of D-modules. Strikes the perfect balance between analytic and algebraic aspects. Editors: Berenstein, C.A., Struppa, Daniele C.
This volume honors the contributions of Leon Ehrenpreis to the theory of Fourier analysis in several complex variables, on the occasion of his sixtieth birthday. The volume contains contributions presented by the major working mathematicians in this area during a conference which took place in 1989, and offers a state of the art of geometry and algebra, as they apply to several complex variables. Editors: Guenot, Jacques, Struppa, Daniele C.
This volume contains the proceedings of a series of seminars in complex analysis and geometry, held at the University of Calabria during the year 1988. This volume contains the proceedings of a series of seminars in complex analysis and geometry held at the University of Calabria during the year 1987.